For the DIY digital audio enthusiast, UPnP is often the bedrock of a home music network. It's an industry standard that defines how media (that's music to us) sources and playback devices interact. It defines how libraries can be browsed, and how playback itself can work. Because UPnP is a standard, it means (in theory) you can choose which UPnP source (Media Server), controller (Control Point), or playback device (Renderer) you like. In practice it can be a bit more tricky than that, with some servers supporting different capabilities. Nevertheless, without UPnP we'd have a much more closed choice of software to construct our home music networks. The downside of standards is uniformity. If a standard is overly prescriptive, it means the software writers have less leeway to be creative in how their software works. And, indeed, many UPnP servers are pretty similar, offering similar browsing capability. MinimServer is different. Broadly, most UPnP media servers approach library browsing from the traditional artist / album / track hierarchy. MinimServer, on the other hand, has been built in a more flexible fashion: using its intelligent browsing mechanism you can select genres, composers and other fields to progressively narrow down the results across the library. You could see this as a bottom-up approach, rather than the top-down driven approach of a hierarchy. Where it really shines is when music wants to escape the industry release-oriented approach. Obvious examples are classical music and compilations from any genre; but more generally it benefits any information architecture that is not hierarchical. You could almost say MinimServer enables the folksonomy of your music collection. The secondary advantage of this approach is that it is suited to large collections because of the opportunity in larger collections to have more diverse metadata; basically, the larger the collection, the more possible values your tags may have and so the more difficult to find music in a strict hierarchy. Like bliss, MinimServer is written as a server side app and, also like bliss, is available for NAS devices like Synology and QNAP (as well as other platforms). There's only one issue with this theoretically flexible approach: it can lead to complexity when the range of metadata values is wide. This may be due to simply incorrect data; or inconsistencies in how data is stored. MinimServer takes the view that existing metadata is presented in its raw form, so such inconsistencies could present a problem. By the way, MinimServer is a UPnP media server and offers no browsing itself. Instead, here I am using dBpoweramp's Asset Control controller to view the library presented by MinimServer. This means the albums for a particular artist are broken up. We can't browse all tracks that are in their rightful genre. Browsing by, say, Dean Martin's tracks, and then genre, will show a fragmented genre list. If only there was a software application that could fix incorrect, inconsistency and incomplete musical metadata... oh wait, there is! bliss and MinimServer both run on NAS devices (and other platforms besides). So I thought it would be fun to use a QNAP NAS for this walkthrough. Generally speaking, once installed both software behave pretty much the same regardless of the platform. To install bliss on QNAP, take a look at the QNAP Music Manager page. For MinimServer, take a look at the MinimServer QNAP installation instructions. So let's enable bliss's tag correction and consistency rules to ensure these issues disappear and make for easier, faster, less confusing browsing. We'll also enable the cover art rule and customise it for MinimServer. In practice, it's often simplest and most portable, in most use cases, to choose folder as the filename. Enabling the cover art rule also means missing embedded or separate image file artwork will be looked up by bliss; using existing art first of all (e.g. embedding an existing folder.jpg into the associated music files) and if there's no art at all, finding it online. Let's now click Apply rules. At this point, bliss starts assessing your music, and showing where music is Compliant (the music obeys the rules we just defined) or Non-compliant. The next one was mis-spellings of artists. Here, bliss has identified the canonical spelling of 4hero and identified where an existing album had an incorrect artist name. 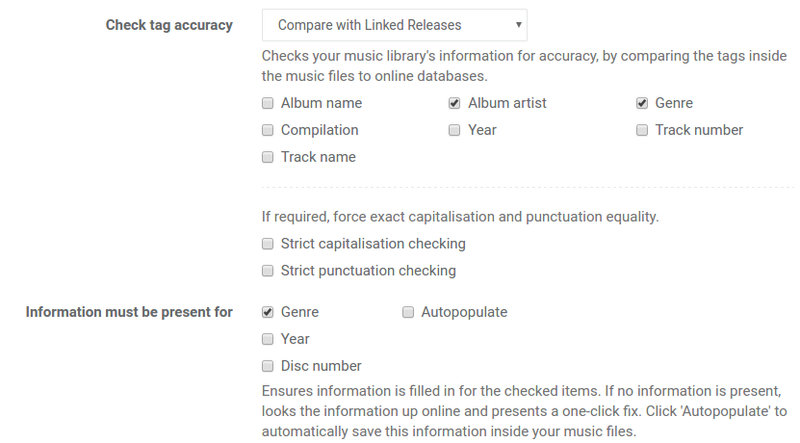 For bonus points it has also identified the genre is yet another synonym of Drum and Bass and offers to change it! Now we've fixed those inconsistencies, let's take a look at MinimServer. We'll need to rescan the library first. Hope this makes your MinimServer browsing a cleaner experience!